Last year I read Sapiens, a book that was recommended to me by several people, notably because it challenged plenty of religious notions and that it would be an interesting read for me. I thought it was an interesting book, indeed, but I didn't think it was worth the hype, given my world view. In any case, I was nevertheless interested in reading the sequel from Harari, so this current book was also on my list. And I must say I think I have a better reception of this book. 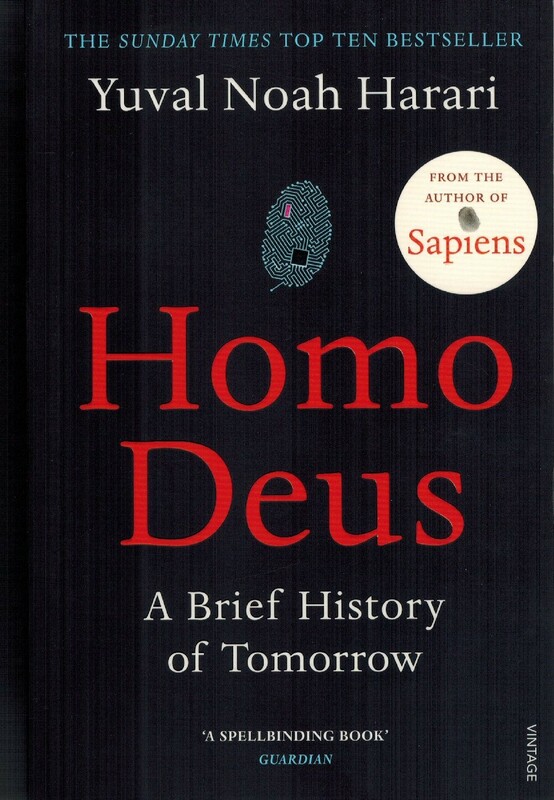 See, if Sapiens was about how humans got to where we are, Homo Deus is about where we are headed to. Parts of the book can be apocalyptic. Indeed, some of it I want to hope that I am not around anymore when it indeed becomes true. There are still parts of the book that shatter one's religious upbringing. I found the opening section quite relevant, where he explains that war, famine, and disease are now a thing of the past. He shows with data how these three worries of the human race have now been slowly eradicated. I find this especially noteworthy since you still find doomsday cults nowadays like the Jehovah's Witnesses who would love to claim that the world is getting worse and worse, and that people are getting more and more hungry, people are getting killed in more wars than ever, and more and more people are dying due to diseases. And if they finally convince you that indeed, wars, disease, and famine are on the increase since 1914, then they would offer you their version of the afterlife. But unfortunately, the data says that these three issues are actually decreasing, and human life is getting better and better. It is getting better and better, in fact, Harari's thesis in this book is that medicine is going to change from curing the sick, to upgrading the healthy. Homo sapiens will slowly be eradicated in favour of superhuman, upgraded, and enhanced versions, ones with almost divine abilities, or Homo deus. I am sceptical, but I do think that what he claims is plausible, if not possible. What I find more disturbing is the data-centrism that Harari calls out. This book was published in 2015, and it predicted Russian meddling in the US elections, Donald Trump winning the US presidency, and the Facebook data scandal. It paints an apocalyptic world where each individual humans don't matter anymore, and humans are reduced to data sources. It's already happening right now, come to think of it. Facebook and Google now know you better than yourself. So humans will slowly be replaced by algorithms, who have perfect memory, and can better predict what you like and what you don't like. This book thus led me to reflect on my interactions with social media and cyberspace. I already resist quite a bit of it: I don't have accounts on Facebook nor Instagram, for example. Nevertheless, I am a user of several technological innovations that do make my life easier, and in order to do that I do give algorithms access to my data. I wonder what the cyberspace scene would look like in 10 or 20 years from now. This book also made me conscious about my mortality. I haven't analysed my DNA sequence but I am considering doing it (my husband has already did so and boy it gives you plenty of insights). I have an app in my phone that tells me how long I would live given current issues (it tells me I will die when I am 82). In any case, this book has resulted in quite a bit of deep thinking in my side. One thing I didn't like in the book was its semi-roundabout way of explaining things, which appeared every now and then. He would be discussing some topic, which would make me think and ask myself why this topic is being discussed, when the point of the book was to discuss the next step in evolutionary development. I am sure that he thought such a flow of argument is needed, but there were times for me that we were so deep in examining a tree when we need to focus at the forest. In any case, I must say I enjoyed this more than the previous book. I give it 4 out of 5 stars.